Johann Senn's father was Franz Michael Senn (1759-1813) the local magistrate in the Tyrolean village of Pfunds. 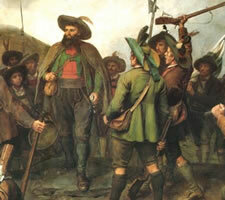 Simply calling him 'the local magistrate' (Landrichter) does not convey his political importance. 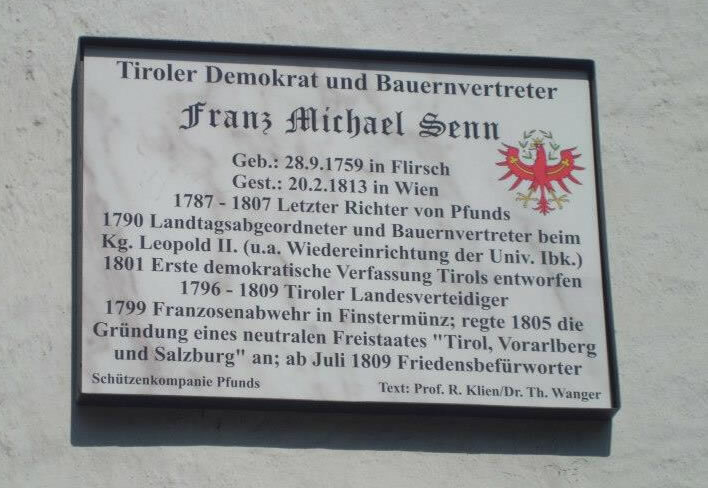 In the political and social turmoil that existed in Tyrol from at least 1780 onwards, Michael Senn played an important role. It was not a role that depended on title or post but simply personality: he was esteemed and trusted by people of all levels in the region. Readers of German will find a detailed but compact review of that role in [Kramer]. 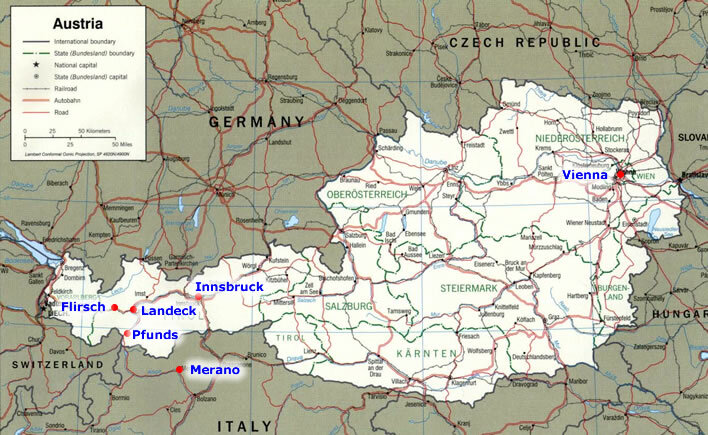 Senn-related locations on a map of modern Austria. Flirsch: father Michael Senn's birthplace. Landeck: mother Barbara Zoller's birthplace and her presumed death place; family home of Senn's friend Aloys Fischer. Pfunds: Johann Senn's birthplace. Merano: stepmother Anna Knoll's birthplace, now a part of Italy. And, of course, Innsbruck and Vienna. Note the strategic location of Tyrol: to the north lies Bavaria; to the south-west, Switzerland; to the south, Italy. Image: FoS / University of Texas Libraries. His character was not that of a politician or courtier. He could be stubborn, difficult, coarse, he was never deferent, his manner was far from all charm and tolerance, his language sometimes mercilessly blunt. He had a penetrating, quick mind, he was driven, was a man of action – but no despot. He was a democrat who was deeply rooted in the common people of the Tyrol, the people from whom he himself, a miller's son, had arisen. He was intelligent and showed a mastery of constitutional and administrative law, perhaps to the point of pedantry. He was physically and intellectually fearless, certainly no respecter of social standing. Even his enemies had to admit that, despite all his rough edges, he was extremely skillful, capable and honest. In the bubbling cauldron of Tyrolean politics, though, everyone had enemies. When later we encounter his son Johann's character we will be left thinking: a chip off the old block. In order to counteract some of the date errors in the Senn biography, wherever possible we have given the evidence from the relevant archives. Michael Franz Seraphicus Senn, baptised 28 September , legitimate son of Joseph Senn and Catharine Pit[t]rich. From the Taufbuch, 'baptisms book', of the parish of Flirsch, in the Landeck county of Austrian Tyrol. Barbara Zoller was born/baptised in Landeck, Tyrol, on 4 December 1763. 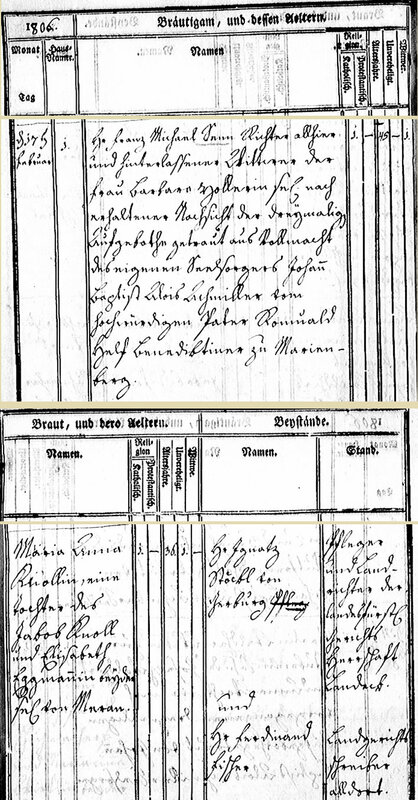 Maria Catharina Barbara Zoller, baptised 4 December , legitimate daughter of […] Franz Xaver Zoller […]. From the Taufbuch of the parish of Landeck [sometimes 'Landegg'] in the Austrian Tyrol. Michael Senn and Barbara Zoller married in Pfunds on 4 July 1790. He was 30 and she was 26. 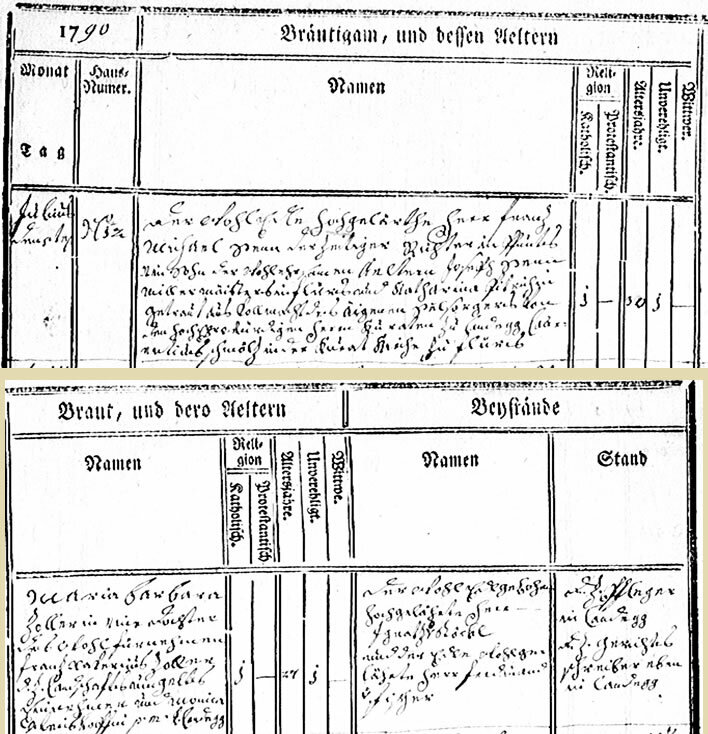 The marriage of Franz Michael Senn and Maria Barbara Zoller in Pfunds on 4 July 1790. Traubuch, 'marriage register', of the parish of Pfunds, Oberinntal, Austrian Tyrol. Michael and Barbara had eight children. Here are the relevant entries from the Taufbuch	of the parish of Pfunds. 1— 7 May 1791: Franz Xaver Joseph. 4— 1 April 1795: Johann Chrysostomus [A modern hand has helpfully added his date of death 30.09.1857]. Two of their children died whilst their mother Barbara was still alive. Here are the relevant entries from the Totenbuch, the 'death register' of the parish of Pfunds. 28 July 1800: child no. 5, Anna Barbara dies of smallpox, four years old. She is one of the 49 children who died in a smallpox epidemic in the summer of 1800, most of them under two years old. The first case was recorded on 21 May and the last on 29 December. At the peak of the epidemic, six children died in June, fourteen in July, eighteen in August and eight in September. It is difficult for the modern mind to imagine what it must be like for a small village to lose 46 infants in four months. 7 December 1801: child no. 8, Franz Xaver Niklaus dies, four days old. At the time of Michael Senn's death on 11 March 1813, the Viennese Totenprotokoll, the 'death report', states that the marriage of Michael and Barbara produced four children and gives their names and ages at the time of Michael's death: Therese [Antonia] (18), Johann [Chrysostomus] (17), [Benedikt] Alois (13), [Maria] Elise [recte Elisabeth] (12). Two of their children, Franz Xaver [b. 1791] and Maria [born. 1792] must therefore have died before 1813. 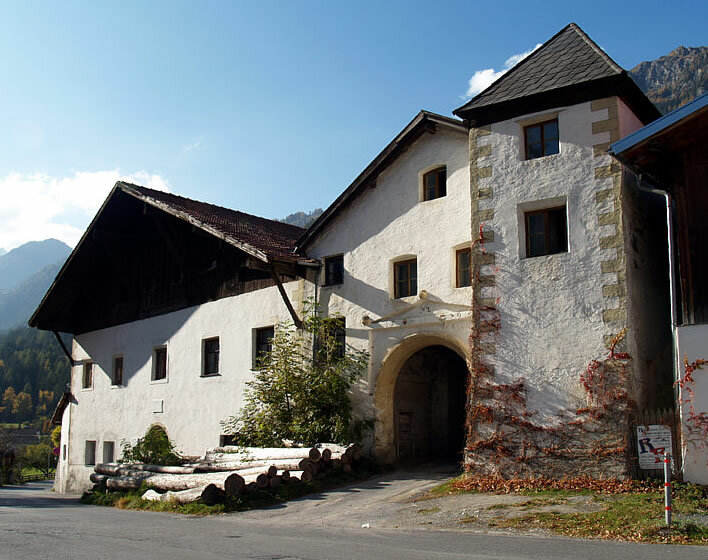 Top: The Richterhof in A-6542 Pfunds (Stuben), the home of Franz Michael Senn in Pfunds and the birthplace of his son Johann Chrysostomus Senn. Bottom: The commemorative plaque above the entrance to the Richterhof. It was put in place on 14 July 1900. Apart from mounting it upside down, there is not much more that could have been wrong: this was not the Geburtshaus, the birthplace, of Johann Michael Senn, but of Johann Chrysostomus Senn. His father was Franz Michael Senn. Johann was indeed the author of the lines quoted from his poem Der rote Tiroler Adler, 'The Red Tyrolean Eagle' not, as here, simply the Tiroler Adler, 'Tyrolean Eagle' – there are a number of Adler poems in Senn's work. He was born in 1795, not 1792. Images: ©MM 2oo8, top,bottom. 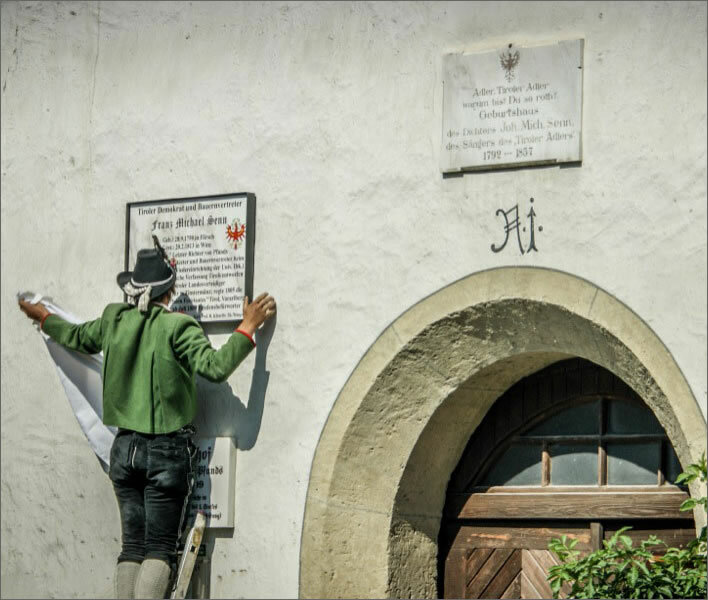 Top: On 15 August 2013 an additional plaque on the front of the Richterhof was unveiled, this time for Franz Michael Senn himself. Image: ©Musikkapelle Pfunds. Bottom: The new plaque is an improvement on Johann's – the subject's name and his birth and death dates are correct. The remaining text probably makes sense to a brevity-averse Austrian history professor with an uncertain grasp of punctuation. Foreign tourists will have to cope as best they can. Barbara Senn died at the beginning of June 1802 in the waters of the turbulent river Inn. According to [Klein, 191, p.3] she had suffered from religious paranoia for several years. We might speculate that the smallpox epidemic of 1800 and the death of her four day old son Franz Xaver Niklaus in December 1801 would not have helped her condition. She was being cared for in Landeck, presumably in her family's home. In a moment of derangement she fled from the house and at some point drowned in the River Inn. Her body was recovered from the river at Hall, near Innsbruck, 80 km downstream from Landeck. Now at last I am capable of writing to you … I still know nothing with certainty but there is just a spark of hope that at least she has not given herself to the water, since she was seen at the fork in the road to Zams … and later at Tannrein … It's possible that, intending to confess and as a chastisement she wanted to make a pilgimage to Wildau[? ], Mieders or Absam. If not that, perhaps she just went astray so that she might still be found and brought back as long as she is on a dry land … otherwise, I believe, I am ready for the worst. Only the entry into my house and the gaze of my children will be, if I cannot bring their mother with me, a scene that makes me shudder. To state the obvious: Johann was seven at the time and his mother's madness culminating in her suicide/accident must have left a deep wound in his mind. He kept that letter safe through the turmoil of his life. When, after his death, his friend Adolf Pichler came to write his biography Pichler stated that Johann's mother had died shortly after his birth, which is perhaps something that Johann had told him, whilst simultaneously saving his father's letter of distress in a dark place. There are depths we cannot plumb here. She may have slipped, but if her death had been suicide, given the moral climate of the time, the twelve year old in the Konvikt would not want to make too much of his mother's scandalous death. Meine Mutter mich in den April. Sent me into April. Our psychiatric department is interested in the way Senn apparently blames his mother for the April First joke of his destiny, but we have no time to discuss their extensive report, which has been carefully crafted on the basis of no evidence whatsoever. His name-day is that of Saint Johannes Chrysostomus, on 27 January. Schubert fans will recall that in 1813 Schubert composed a terzet on the occasion of his father's name-day, not his birthday. Michael Senn's second marriage was to Maria Anna Knoll (1772-1832) in 1806, the year before Johann entered the Stadtkonvikt. He was 47, she was 34 and we read that she was born in 1772 in Merano, which now belongs to the Italian South Tyrol. She died on 8 March 1832. The marriage of Franz Michael Senn and Maria Anna Knoll in Pfunds on 17 February 1806. Traubuch of the parish of Pfunds. The couple had two children: Franz, born in Pfunds in 1809 and Josef, born in Vienna in 1812. 7 May 1809: Franz Jacob [died 1836, according to marginal note]. Most of the details of Michael Senn's personal life are unknown. However, we have an interesting insight into the manner of his death, for which we have to thank the Viennese police, of all people. On 27 February 1813 they arrested a businessman from Voralberg, Peter Josef Feuerle, about whom they had political suspicions. Sewn into Feuerle's coat pocket they found a sealed letter from Johann Martin Schärmer (1785-1868), a young artist from the Tyrol, who at that time was working and studying in Vienna. Now I have to bring you the extremely sad news that on Saturday at nine-thirty in the morning our cousin [Michael] Senn died of typhus; just think of the sad situation of his poor family. Eight days ago yesterday I lunched with him. He lay down straight after lunch, never to get up. Johann Schärmer's father, Alois, was a lawyer and the Mayor of Nassereith, a village in the Tyrol (about halfway between Pfunds and Innsbruck). He also had regional positions in the Inntal that would have brought him into contact with Michael Senn. Johann initially went to the University of Vienna in 1805 to read philosophy, but his artistic talent led him to a career in art. We can assume that he stayed in the Stadtkonvikt whilst he was at the university. Johann was also a friend of Franz Schubert and Franz von Schober. Given the closeness of the Schärmers and the Senns it would seem reasonable to expect that Johann Schärmer knew and kept in contact with Johann Senn in Vienna. Indeed, Senn seems to have been the entry point for his fellow Tyrolean Schärmer into the Schubert/Schober circle.